Restoration project was named ”Airbridge”, because helicopter was used to carry the cravel material to the potential spawning sites. In River Kymijoki there are lot of rapids and stream areas. By other means the transportation of gravel would be very difficult or even impossible. River Kymijoki has been an important salmon river in the area of Gulf of Finland. The natural production of salmon has diminished significantly. River environment has undergone severe changes due to actions that are done because of flood protection, timber rafting and power plants. Already during this autumn first adult salmon will spawn in the areas that are restored. If the project goes as it is planned, the juvenile production of salmon can nearly double. Mr. Kari Taimisto from Cursor Oy − Kotka-Hamina Regional Development Company – says that so far on River Kymijoki there has been only few spawning areas for salmon and trout. When we succeed to place right kind of gravel material on the river bottom, also fish will find their way there. 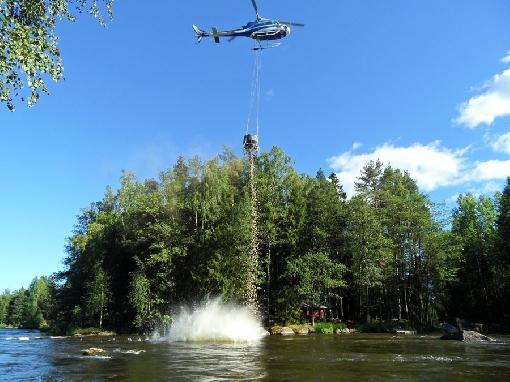 During the “Airbridge” nearly 3 tons of gravel was moved to 26 spawning areas that are located in six different rapids sites. Photo: “We could use only natural gravel. Crushed stone is not good material; sharp edges can harm fish and disturb breeding”. Original story by Markku Rekola and Cursor. Photo: Cursor.